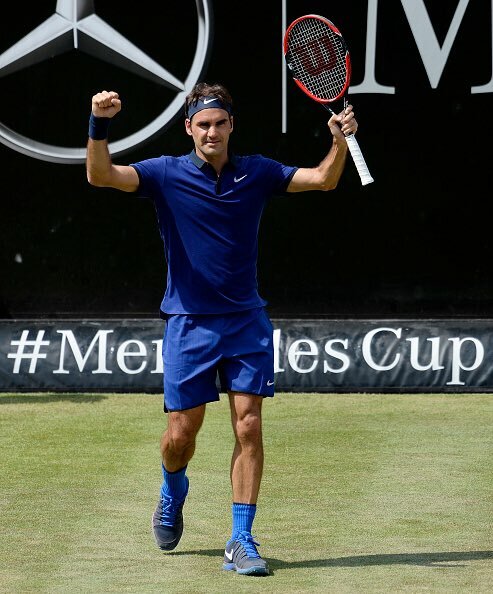 Back to back wins for the GOAT for the first time in a while as he defeated Florian Mayer 7-6(2), 7-6(1) to book his spot on the Mercedes Cup Semi Finals in Stuttgart. The win also sees Fed move past Ivan Lendl on the Open Era all time match wins list with 1,072 victories with only Jimmy Connors ahead of him on a whopping 1,256 wins. Next up is Dominic Thiem who's had a stellar year so far making 4 finals and winning 3 titles and will no doubt offer some stern resistance when the two meet tomorrow. Mayer won the toss, elected to receive and it almost paid off as Roger had to find a peach of a second serve to save break point before holding for 1-0. Mayer then held to 30 and both players began to roll on serve exchanging love holds and from 3-3 to 5-5 only only 3 points were won on the return. With Mayer serving at 5-6 he slipped to 30-40 but Roger shanked a backhand on set point. The German went onto hold and the set went into a tie breaker. Roger got off to the peRFect start going up a mini break with a sweet pass and rolling through the tie break to take it 7-2. Into set 2 and Mayer was immediately under pressure, having to save 2 break points in order to hold his opening service game. After pulling off the hold the German snatched back momentum to break for a 2-0 lead. Roger was able to respond immediately though, firing off 2 great forehands for 0-30 and although Mayer held a game point after saving break points from 15-40 Roger won 3 points in a row to get back on level terms. Just like the first set both players started to roll through on serve with comfortable holds. At 4-5 Fed fired down a 1 min 8 second hold but Mayer responded in kind to guarantee himself at least another tie break. It looked like he might take it 3 when Roger slipped to 15-40 but he again came up with the goods saving those 2 and a third set point to force another breaker. Again just like the tie break from set 1 Fed got off to a flyer, moving up 6-0 with some crisp hitting before sealing the deal 7-1. Decent win here as Roger took things up a notch from yesterday and I thought this was a solid performance. Both guys went for their shots and it was a really fast paced match with some quality shot making from both sides. Fed looked to be in much better touch too hitting some sweet groundstrokes and showing a lot of deft touch when he needed it. The serve was impressive too firing down 15 aces, of course Mayer isn't the best returner, but it definitely proves his serve is right there. He said yesterday in the on court interview the speed was there, it's just about the placement now and he found some line lickers in both breakers to run away with them so after just 2 matches I think he is right where he wants to be. Other than that not much to say, Fed was 6-0 in the H2H so always had the upper hand but Mayer has made 2 Wimbledon Quarter Finals and knows how to play on the grass and post Australian Open I think this is Roger's best win of the season. Next up is Dominic Thiem who took out Fed in Rome and will provide another test for the Swiss tomorrow. I watched some of his match against Youzhny earlier today and Youzhny was very much in the match, holding a break point at 5-5 in the decider and then throwing in a poor service game to get broken at 5-6 so I like Fed's chances. He'll need to be wary of Thiems fire power but if he can return well and get the serve forehand combo working well I back him to come through in 2 close sets. Took it up a level from yesterday, 15 aces, solid in both breakers and into the semis. Thank you for write up as usual Jonathan….Had chance to watch whole second set today….Other than his Backhand shanks, rest of stuff seems working better when needed….Its also good he found the gears needed when it matters to make sure he wins in two…. I do expect Roger makes it final now, hope backhand shanks won’t be costlier with Thiem…forecast seems not much promising for next couple of days though it seems…. Yeah I mean he is still rusty, but that’s to be expected. Just looking at weather now, doesn’t look great. I had a quick look at some webcams, looks damp but couldn’t tell if it was raining. Great result thanks again Jonathan..
Congrats Roger and Nambi too! Also How’z that Clic was 2nd seeded here instead of Thiem? The draw for Stuttgart came out when RG was still going on. Thiem was ranked lower than Cilic then. Hi there Nambi… I was thinking that too.BBut I am glad that Marin “Cough Syrup” Cilic lost to R Stepanek. He’s quite a solid grass court player. I was watching the highlights of F Mayer and Federer, and for a moment I thought I was watching E Gulbis as Mayer has the same sort of Windmill, Watch Wind up forhand shot and a double handed backhand. But I am glad Federer got the win. I hope Federer concentrates on his match with Theim tommorrow instead of daydreaming and looking at the clock for Switzerland match. But hopefully he will be match sharp and get it done in straights and quick time. Come on Roger. Thanks for the write-up, Jonathan. Good to see good service stats for a change – it’s been a while. Otherwise, it looked a bit on the close side to me. Stepanek has been in pretty good form, could have beaten Murray at the French. He was top 10 though so clearly got game. I think Fed will have asked to play early QF too so he would be first semi final so he could watch football. I dunno if it’s 100%, just saw it on Twitter. Man a life I wnt on the atp tennis website and all I could see is Djokovic has broken $100mill barrier to 200 weeks and counting to him on 99 to become 100 consecutive weeks. Has won 4 non calendar consecutive majors plus the world tour finals. I once upon a time used to hate Nadal but Novacaine “puts you to sleep and numb” djokovic clown is seriously seriously seriously and seriously gets me annoyed and vexed. As I really despise his character and game play. He is the most insincere and genuine Tennis player I have watched. If he stopped working and faking the spectator’s his trying to make them adore him then I’d probably of liked him. He knows that the majority of the worlds Tennis fans love and adore Federer and Nadal and you can see in body language and facial expressions that deep inside he hates Fedal and the crowd. What was funny this year’s French they deliberately gave Serbians and Djokovic supporters more tickets to make him look good. Plus the atp aren’t daft as there was no Roger or Rafa so they had to fill the stadium up with pro Djokovic fans. That way itllooks like around the world that Djokovic is liked. Which is not true. Look at the last US open the entire 15, , 000 fans were all on Roger side. Lol . Even at the world tour finals when the djoker was playing Nishikori and someoneshouted out ‘come on Roger’ Djokovic flipped and got angry. And that was his true feelings which he tried to hide after the match like always. Man I really don’t like this Djokovic character and I would like to see other people win the tournaments instead of him and Boris”the bloated orange”Becker. Can you tell that I don’t like Djokovic. Man, what a load of plant pots. Tournaments” . It takes away the beauty of the game. Sorry for grammar missing word. I meant when you see Federer play….. I don’t feel that strongly about it, not someone I’d follow or pay to watch, but I don’t think he’s a total knob. Deffo has some sort of wanting to be loved thing going on but been like that for years. Haha. Your comment made me laugh so hard. I feel the same about Djoker. Can’t stand the sight of him. Even his “chiapet” hair style, that never moves or even appears to grow bothers me. I’m so thankful for the grass court season and that we’ll get a break from all the obnoxious Djoker fans til Wimbledon. 😆 I had to look up chiapet never seen one before. Hi there Sara Beth….yep I have to agree with you regarding Novacaine hairstyle. He has that unusual hair like you said that never moves or seems to grow! !! Lol. I bet he’s one of those people like from the film ‘Evan Almighty’ when he shaves it grows back straight away like wise hos hair. He will cut his hair and it will be still the same. Lol. I will call him Novak ‘hair almighty’. Tbh he has a hair style that he can’t do or change unless he dyes it which he probably won’t until he gets grey hairs. One thing is at least his barbers knows how to cut his one dimensional hair to go with his one dimensional tennis style. Lol. Serajul, are you sure you don’t like Djokovic? I agree…he seems to be a fake. Watched the match on utube. Roger hit some nice shots but where was the bh? Hi Sue… am I that obvious. Lol. I know he is a champion but he tries so hard to be liked that it becomes cringe worthy. If he was himself then maybe myself and others would recognise his accomplishments more as he has achieved few high records. But unfortunately it’s him and his entire team that gets me angry. Tbh I don’t mind Marian Vaida its Boris that gets me the most as any one who knows about Tennis is that Boris was a known cheater which he learnt from his coach Ion Tiriac (the godfather of Tennis). And that’s his moniker , so that says it all. Anyway I hope Federer comes through against Theim. Allez. Yeah would be interesting to know what Fed’s appearance fee will be. Clearly will be a tie in with Mercedes as part of existing deal. Much better today! Thks for the quick report J! Yes, when he serves well, it all kicks off! Hoping he can keep it up v Thiem who was troubled by Youzhney and his old school grass tennis!! Well, he has done well so far for the tourney money men so hoping he can get thru to final v Delpo? That wld be fun! Footie? What footie? ?? Weather not looking too good, hope they get on court today. Oh what a pleasure to watch tennis again after a boring French Open. Thiem is good to watch. Fed has to be sharper than today, though Mayer did play well. Thank Goat, tennis has come back to my life again. Joy to watch Fed again for few days in a row! Still needs fine-tune but good to see some clear progress. It’ll be a test tomorrow vs Thiem, hope for a good match and yeah, would be nice he can get through to the final possibly vs Delpo (aha, didn’t know he’s beaten Dimi? Good for him but Grigor…Is he going down?). Allez! Dimitrov having a terrible year. Was 8 in the world and a Wimbledon semi finalist 2 years ago. Now completely out of it. Needs a coach or something. Stan the man has hired Richard Krajcek the former Wimbledon champion for the upcoming 2016 Wimbledon. I know that kraijcek was a really good volleyer so maybe wawrinka wants to enhance his already great game. Wow stan has got a insane backhand and forehand and if tunes his volleys with the help from kraijcek then he will be a awesome specimen of a tennispplayer. God help us all .Thats what the other players will be thinking. Lol. I think it’s a good move by wawrinka. Stan has absolutely terrible volleys so it’s a smart move. If he can finish points at net on grass then he will be a danger. Woof. Guess I forgot F Mayer was actually a top 20 player at one point. Agree that there seemed to be improvement from Fed. Interesting that he was able to access a kind of hyper-level immediately after getting broken, but not otherwise (tiebreaks, perhaps). Saw a stat saying they were only 2 points apart outside of the tiebreaks, but IN the tiebreaks Fed dominated completely. Ah interesting, not seen Mayer’s quote but it’s a good one. He is going to know better than most as he’s played Fed a fair bit on grass. So can 75% Fed beat Thiem on grass? Will be interesting. From what I saw from the highlights, Roger is still a bit rusty. That is to be expected. The most important thing is that he stays HEALTHY. If he continues to win, his game and his confidence will be back just in time. With that being said, I am not sure what to expect from tomorrow. Thiem is a tough cookie and he is young and full of confidence. If Roger somehow beats him and wins the title, I’ll be VERY happy. But still two matches to play. I am just glad that so far, the body is still OK (I hope) and I am happy to see him play again. Of course, he has hardly played this year. I think he said he only played tennis for first time 5 days before Stuttgart since leaving Paris. I think 60/40 for Fed vs. Thiem. Optimistic 🙂 on form I think Thiem can challenge, might be a three setter but who knows, if Fed rushes him like Brisbane then got a good chance. I was a litle surprised that there was not a little ceremony to honor Fed’s 1072 nd match win.. Its a huge achievement! Tennis TV was finally working last night so I got to see the whole match, unlike yesterday when my feed went out during the last 3 games of Fed’s win over the kid. Nah, he has only gone to 2nd on the list. If they start doing ceremonies for records like that he’d be having one after every match! I saw some people had problems with TennisTV. worked fine here in UK so dunno what it was. that was some set!!!! from the maestro!! back in business wow!! Disappointing loss for Fed, but I’ve been following Thiem for a couple years now and think he is a terrific young player. Now that Fed is no longer in the tourney would love to see a Thiem vs. Kohlschreiber final. Was it that bad? What happened? IMO, it wasn’t that bad. He made lots of great volleys and great shots overall. The problem was that he was very inconsistent and couldn’t sustain a reasonable level throughout the match. Hi all. … I am a little disappointed that Federers lost having had 2 match points in the 2nd set tiebreak. Tbh this loss was on federer racquet. But congratulations to Theim for the win. This is not a really hurtful loss as it was kind of expected from his long injury comeback as he will need some time to get the rust out. I hope he can defend his Halle title as if he loses there it will hurt alot more. But tbh I have mixed confused feelings about today’s match. Only one good thing is that the Swiss have won their opening Euro match. Anyway !!! Eight sets of tennis over four days. Final on his racquet vs. very high caliber player. Patience my friends, he’ll get there. I really hope he wins in Halle… Hasn’t picked up a title this year..